If you open the newspaper to the business section or listen to a politician talking about economic growth in the country, it may seem that manufacturing is booming in America. After all, the U.S. auto industry saw record sales in 2015, selling 17.5 million cars and light trucks. Americans spent an estimated $570 billion buying new rides. With thousands of jobs being added in the past few years, people everywhere are praising the industry for rebuilding our economy and the middle class. But as those of us who work at auto plants know, that's not the full story. For five years I've worked at the Camaco auto parts factory in Lorain, Ohio, which makes metal seat frames for multiple automakers. Camaco is a major employer for Lorain and the surrounding towns -- even my son and nephew work there with me. I began working in 2011 at $10 an hour and have seen small, 50 cent raises throughout the years. I now make $12.18 - one of the highest wages at the plant. And yet when I return home at night, I'm scrounging to feed myself and my mother, who I take care of. It's not uncommon that I have to call my friends or family to help provide dinner. I have three granddaughters in Atlanta, but I can't imagine a time in my future where I'll have enough money to visit them. And I'm not alone. When I look around the factory, or I talk with my son, I realize we're all hardly scrapping by: We find a way to save multiple pay checks in a row to pay for rent, and the few remaining dollars go to gas and food. There is not a single extra dollar. The truth is that while auto jobs used to be good jobs, we now have more in common with workers at McDonald's or Walmart. 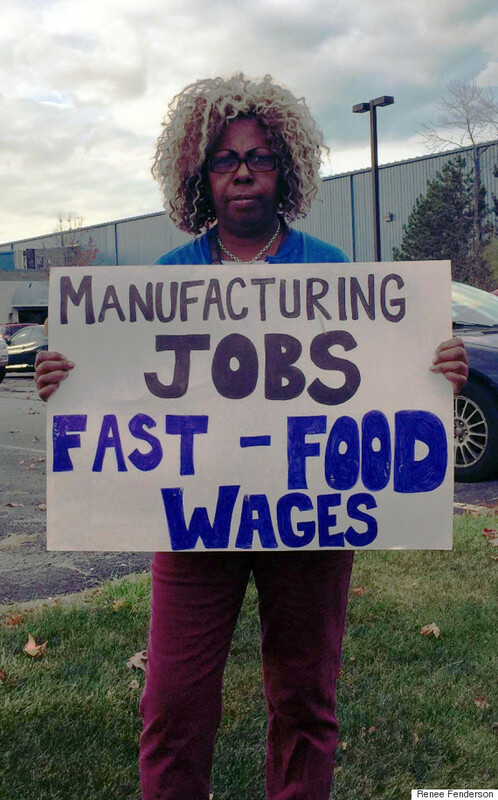 One-in-four of the 600 jobs at the Camaco plant are temporary positions that pay $10 an hour. Meanwhile, wages for all of the plant's production workers are capped at just $12 an hour -- with an 18-cent raise a year for a "living fee." I haven't even received that raise this year. Temp workers are often kept in limbo for up to a year before being hired on full time. And turnover at the plant is off the charts, with a manager recently admitting that 1,500 workers have cycled through the plant in the last two years. The company has been forced to hire three temp agencies to find employees, recruiting workers from as far away as Cleveland. The same thing is happening across the country. From 1976 to 2006, manufacturing workers earned more than the average U.S. worker. But by 2013, the median wage for manufacturing workers was 7.7 percent less than for the typical American worker.Nationally, one out of every four manufacturing workers makes $11.91 or less, and that doesn't even count the growing number of temporary workers. It's even worse for auto parts workers like myself who have seen real wages plunge 14 percent in the past decade. It's time Camaco and other manufacturers acknowledge what we workers already know is true: auto jobs are no longer a ticket to the middle class. We can't afford any of the basics of a middle class lifestyle, like traveling to see our grandkids or going to the movie theater. And this is bad news both for the workers and for our local communities. When workers are forced to think about every penny we spend, we can't contribute in a meaningful way to our town's economy. That's why this Saturday I spoke at a town hall meeting in Lorain to sound the alarm on the plant's unfair pay and working conditions. And I was joined by my fellow workers, local mayors, community leaders, and members of the clergy who all know that when you pay and treat your workers right, everyone benefits. I spoke out because I believe in fighting for myself, for my son, for my nephew, for workers at Camaco and for auto workers across the entire country. Let's make the headlines about America's manufacturing boom not only true for investors and companies, but also for the workers who make it all possible.